Sony spent 2017 releasing pricey powerhouse cameras like the A9, but today the company announced one that sounds almost as good at half the price. The new full-frame A7 III splits the difference between the pixel-packed A7R III and the A7S II, the company’s low light and video king. It boasts big-time speed and just about everything else you could ask for, all for $1,999 (body only) when it ships in April. The A7 III is being positioned by Sony as the “basic full-frame model” of its mirrorless camera lineup. But the new shooter is anything but. The centerpiece of the A7 III is a brand new backside illuminated 24.2-megapixel sensor with 5-axis optical image stabilization. A new version of the company’s Bionz X image processor is inside the camera as well, doing all it can to squeeze the most out of that sensor. The results read like top-of-the-line flagship camera specs. The A7 III shoots stills at up to 10 frames per second in RAW or JPEG, with a buffer of 177 images for JPEGs, 89 images in compressed RAW, and 40 images in uncompressed RAW. It captures images with 15-stop dynamic range, and outputs 14-bit RAW files. And it shoots 4K HDR video, as well as 120 frames per second high speed footage at 1080p, and includes (of course) the ability to capture in the more cinematic S-Log 2 and 3 color profiles. The processor is efficient, too, allowing the camera to capture up to 710 shots on a single battery. The A7 III also features 693 AF points that cover 93 percent of the frame, which work together to offer autofocus that Sony says is twice as fast as was found on the A7 II. The AF system is supposed to be robust even in tricky low light situations, too, which is good because the backside illuminated sensor allows an outrageous max ISO of 204,800. Other features of note include a 2.3 million dot OLED viewfinder, which is noticeably smaller than the one on the A9 or the A7R III. The A7 III does have USB Type-C, though, and there’s an AF joystick on the back of the body, which is weather resistant (but not 100 percent sealed). There are 11 custom buttons scattered around the A7 III’s body, and the camera also (mercifully) includes the customizable “My Menu” feature that Sony launched on the A9, which lets users cut through the company’s often byzantine menu system by creating a page with all the options they most regularly use. For a “basic” camera, some of these specs are frankly hard to believe at first glance. 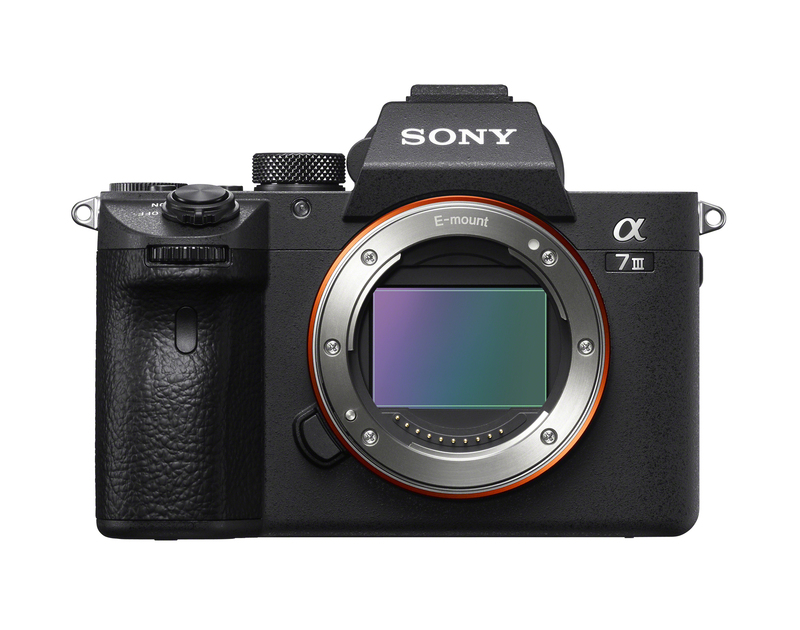 But when you look at how fast Sony has iterated over the last few years, and the deep line of cameras that have come to market as a result, it’s really not that surprising that something like the A7 III could exist at a competitive price point. Some of the company’s most treasured features are missing, like the blackout-free viewfinder of the A9 and the A7R III, and full weather-proofing. The touchscreen on the back is also slightly limited in movement, as it only flips out and tilts. Something tells me plenty of people are going to be happy with those tradeoffs if they’re getting flagship performance at more than $1,000 less, though. Sony’s been leading the way in the mirrorless camera segment for a while now, and has been coming particularly hard at the full-frame market, which is still dominated by DSLRs. But Sony passed Nikon in full-frame sales last year, and a camera like the A7 III is likely to help the company try and dethrone the king.